The Soft Sell group exhibition is on at Berlin’s ROOM E-10 27 at Center, opening November 2 and running to December 2. Featuring Aline Bouvy, Clémence de la Tour du Pin, Julius Heinemann, Harry Sanderson, Maximilian Schmoetzer, and Omsk Social Club, the show explores the role of architecture in terms of asserting and determining a subject position. Maximilian Schmoetzer, And then masses of detached stones and other accessories common to the genre. (2017). Installation detail. Courtesy the artist + Room E-10 27, Berlin. 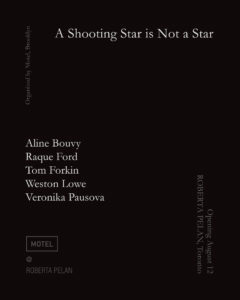 The A Shooting Star is Not a Star group exhibition is on at New York’s Motel, opening August 12 and running to September 16. 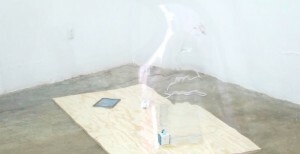 Organized by Roberta Pelan, the show features Aline Bouvy, Weston Lowe, Raque Ford, Tom Forkin and Veronika Pausova. The press release contextualizes the work within the world of linguistics and the elaborate manipulation of ones own vocabulary to avoid telling a lie. Aline Bouvy, ‘Not much in my pockets’ (2015) Install view. Courtesy Exo, Paris. The HYPOKEIMENON, en Dessous du Sang group exhibition at Brussels’ GNF Gallery opened April 21 and ran to May 20. 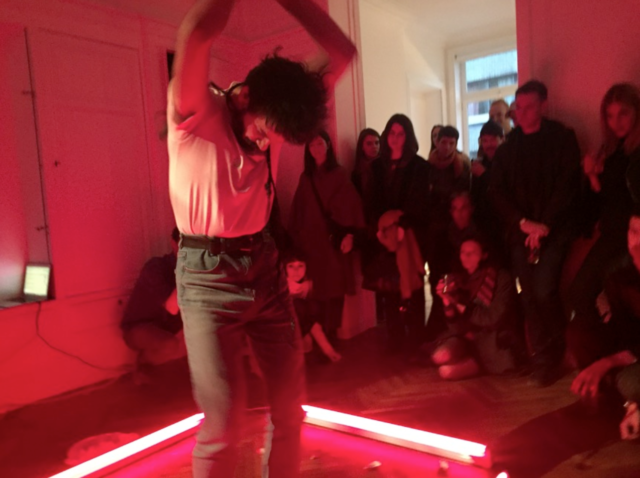 Jude Crilly, ‘Wet News’ (2017) Performance documentation. Courtesy the artist + GNF gallery, Brussels. The HYPOKEIMENON, en Dessous du Sang group exhibition at Brussels’ GNF Gallery opened April 21 and ran to May 20, 2017. 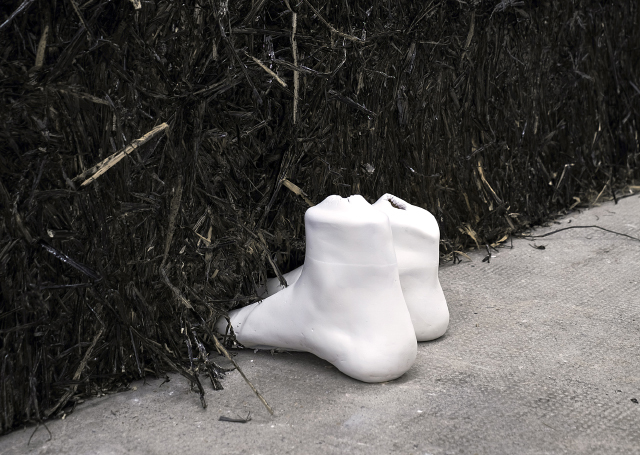 The Form Cannibalism group exhibition is on at Waregem’s The Stable, opening March 24 and running to April 30. The show features work by Aline Bouvy, Joachim Coucke, Olga Fedorova, Indrikis Gelzis, Erin Jane Nelson, Anna Solal, Cleo Totti and Tom Volkaert. In an exploration of the parallels between artist and cannibal, the exhibition references Bill Shutt’s thoughts in Cannibalism: A perfectly natural history (2017) where he researches human consumption over the centuries. Piercing through outer layers to reach flesh and bones, each artist reflect in one way or another “the current state of the body” and “leaving nothing untouched” in the research of their subjects. 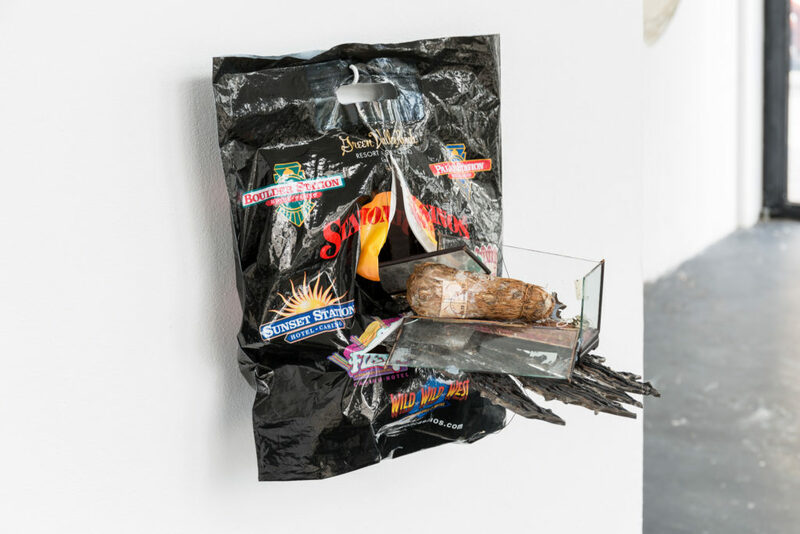 Aline Bouvy presented solo exhibition Who will wear my teeth as amulets? at New York’s Motel which ran from June 25 to July 24, 2016. Curated by Brussels-based collective Bunk Club, the installation consisted of four new figurative wall reliefs, cast from acrylic-modified gypsum and arranged in a narrative tableaux, reading across the gallery as a life-size frieze. The figures hung on top of a wall drawing made with linoleum, spanning the entire space. The grotesque and mischievous characters evoke a sense of voyeurism from the viewer while maintaining an unapologetic detachment. 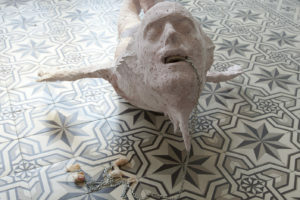 Aline Bouvy’s Who will wear my teeth as amulets? was on at New York’s Motel, running from June 25 to July 24, 2016. Header image: Aline Bouvy, Who will wear my teeth as amulets? (2016). Exhibition view. 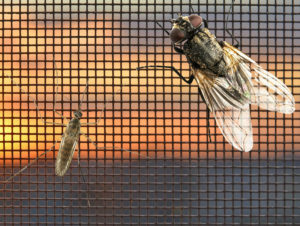 Courtesy Motel, New York. 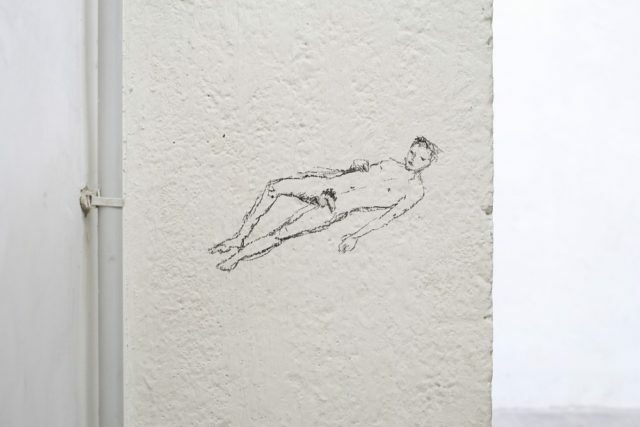 For two weeks in July, exhibition space Exo in Paris hosted Belgian artist Aline Bouvy‘s solo show, Sorry I slept with your dog. Little information was given with the announcement of the show apart from an image which stood in as the Facebook event cover photo of one of Bouvy’s drawings of a worried face next to a sculpture cast of a foot. The face looks worried by how close the foot is and also potentially how contorted and flexible the person out of sight’s leg is. Bouvy’s drawing manages to make the viewer know this. It looks at you. Aline Bouvy, ‘Inclusive Practice’ (2015) Install view. Courtesy Exo, Paris. Aline Bouvy, ‘Not much in my pockets’ (2015). Install view. Courtesy Exo, Paris. Underneath the charcoal man on the wall is everything he had in his pocket, according to a story that is so present inside all of the elements in this show and in Bouvy’s wider practice -without being verbalised. Of course the plaster casts of some buttons, a lighter, half a domino and some other bits that are lying on the floor are not from this guy’s pockets because he is a drawing, but Bouvy doesn’t even make you ask this ridiculous question. You just look at it and feel melancholic and you understand something. Aline Bouvy, Sorry I slept with your dog (2015). Exhibition view. Courtesy Exo, Paris. 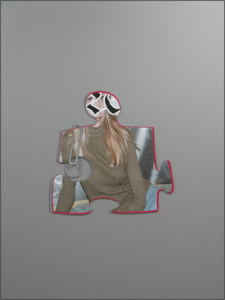 Aline Bouvy’s Sorry I slept with your dog was on at Paris’s Exo, running from July 9 to July 16, 2015. 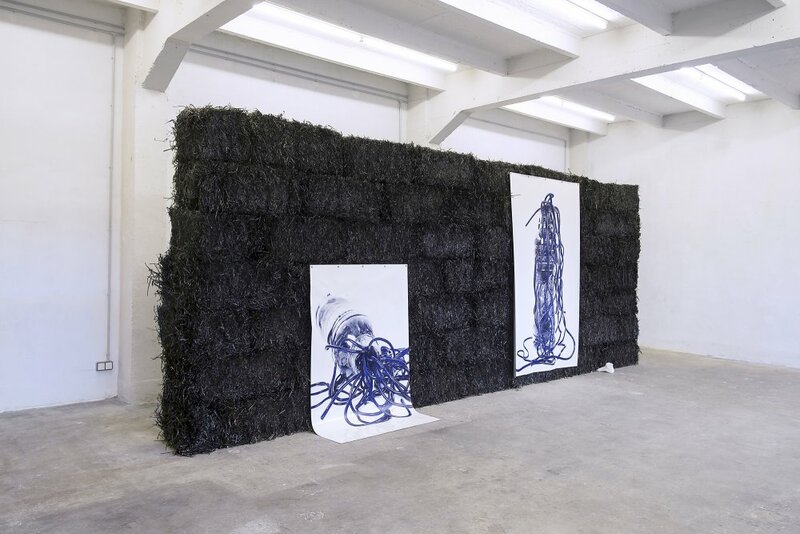 Header image: Aline Bouvy, ‘Beg to bend over I + II’ (2015) Install view. Courtesy Exo, Paris.